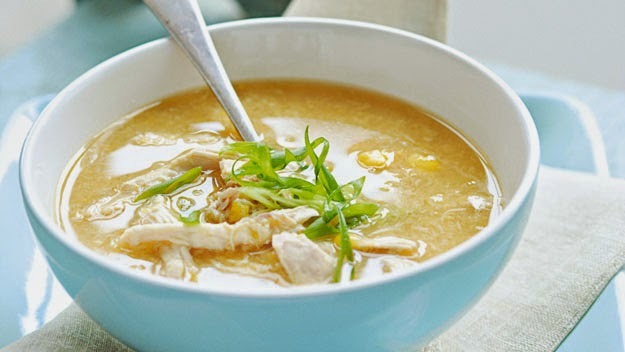 Sweet Corn Soup is very delicious. You can make it vegetarian or non-vegetarian. In this we use a sweet corn and some vegetables and make it non vegetarian.You can use any type of vegetables according to your taste.Sweet corn is a main ingredient in this.It is very easy to make and very yummy tasty soup.Here i give you a simple steps to make this. Hop you all enjoy it. Wash corn with leaves to wet it. Microwave for 3 minutes. Scrap corn kernels with a knife. Grind 1/2 of the corn in a mixer with 1/2 cup water till smooth. keep some corn whole. Microwave water, chicken and salt in a covered dish for 6 minutes. Remove flesh from chicken pieces. Keep liquid aside. Discard bones. Put corn, stock, chilli sauce, sugar, pepper and ajinomoto. Microwave covered for 4 minutes. Add cornflour paste, cabbage, and carrot. Microwave uncovered for 6 minutes. You can remove chicken and florets of cauliflower or broccoli for veg version.